Marion Manufacturing Company is a Connecticut based small business founded in 1946 and located in Cheshire Connecticut. 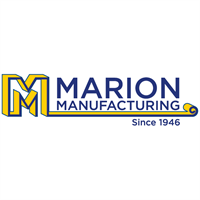 Marion Manufacturing was started as a progressive die stamper and remains that today, enjoying a worldwide customer base. For over half a century Marion Manufacturing Company has been a leader in progressive die stamping components. Marion also has vast 4-sided stamping and wire form capabilities, CNC Machining, Wire EDM, as well as assemblies and progressive eyelets. Marion designs and builds all tooling in house. Medical, Consumer Products, Automotive, Aerospace, Electronics, Telecommunications, and more.